Why didn’t Jesus pray for people to stop sinning? Why didn’t He offer to help? This is crucial for us to understand if we are going to walk in freedom. Why didn’t He use His power to help the drunkard, the thief or the adulterer? When we realize that we don’t need His power encounter, but rather His truth encounter, we will stop waiting for our deliverance; we will walk in it. Jesus didn’t pray for people to stop their sinful habits, because He provided a way for them to stop. We have more of a choice than we realize. He can’t manipulate our wills even if it is for our own good. 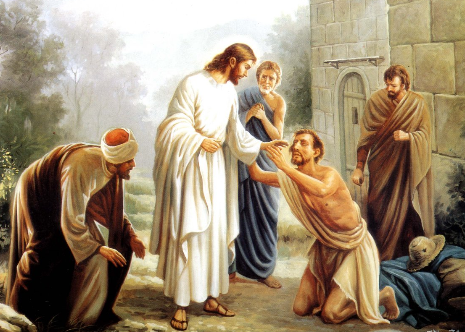 Today many Christians are waiting for Jesus (or a minister) to come by and lay His hands on them like He did for the sick, so they’ll stop their sinful habit. People are praying for God to “take this sin from me”. Do you know that is an ineffective prayer? You and I will wait a long time, but the Lord will walk right on by. “Why doesn’t the Lord help me?” you might ask. The Bible says He already has … you just don’t know what He has done for you. We haven’t taken advantage of what He’s done for us. We haven’t learned how to appropriate what He’s already done. That is the simple truth of why we aren’t free now. Let me say here that it is fine to have people pray for us when we a struggling with a sinful habit. Confessing our faults to another humbles us and sets us free from pride so we can receive more of God’s grace. However the effectiveness of a person praying for us is really about them praying for us to recognize the blinders and demonic interference, so we can receive the truth that sets us free. With an open mind and a teachable heart, let’s look at what the Lord has already done for us. Remember this, “Christianity really works”. God gave us a way to live in Christ that promises 100% victory. If you and I are not experiencing victory it’s not because God’s plan is weak; it is because we haven’t correctly learned how to take full advantage of Biblical truth in our lives. It’s like having lots of money in the bank but no knowledge of how to fill out the withdrawal slip to get the money out. If you’re ready to get down to business then let’s read on. Don’t be in a hurry; sometimes this process of freedom takes awhile before you get a handle on it and your thinking aligns with God’s Word. Posted in Most Popular Articles and tagged Christian Maturity, Healing, Jeff Krall, Prayer, Rejection on March 29, 2012 by Jeff Krall.